Trooper is my first hamster. He's about 8 or possibly 9 weeks old, according to the shop. I had been thinking to myself recently that, you know, I missed having something fluffy around but I didn't want to get rats because they ideally need multiples. Didn't want mice, too skittish, rabbits too big for this small flat, so I'd never given a hamster a go before, and they like to be on their own (at least Syrians do.) I know I can commit to giving a tiny thing a good life during their brief stay on this mortal coil. So I gathered the necessities online and then went to the shop. Trooper was still in with his brother, a white and brown paint coloured boy who leapt right up into fighting stance when the shop assistant needed to disturb them both to get a better look for me. There was no such nonsense with Troop. He blinked, blearily, a couple of times as hamsters seem to do, and then good naturedly looked around. He didn't show the slightest inclination towards biting the shop assistant when she checked his plumbing, just to make sure he really was a boy. After she was unable to catch him, I picked up the takeaway box and showed it to him. He sniffed it, then climbed right inside. The deal was done, and he came home. On the way, he seemed remarkably calm and interested for a recently displaced rodent, and my partner remarked, "What a trooper!" I left him alone for a solid day, aside from refilling his food dish. He kept doing this thing where he'd use his water bottle to kind of parkour up to the top of it in order to investigate the tank lid, but would fall off every time. I watched him go to a big puff of kapok fluff I laid around for him, tear off a big chunk, and then drag it to the spot where he kept landing when he fell. He'd start the whole process again, but this time landing on a soft cushion. Pretty switched on, for a hamster. The wheel I had ordered for him was much too small, poor guy - his back was almost a perfect C in the thing, so I took it away from him and resolved to get him a better one in the morning. I felt so guilty, but Troop didn't seem too broken up about it - he just looked at me, then went to bed. In the morning, I went to refill his food dish and he happened to be out at the same time. He came up to my hands and took a good sniff, touched them with his paws, climbed up on one, then hopped down. I tried offering him a treat and he sniffed it, but didn't take it. When I left it lying around for him though, he stuffed it down himself quite happily. He seems to watch me quite a bit. 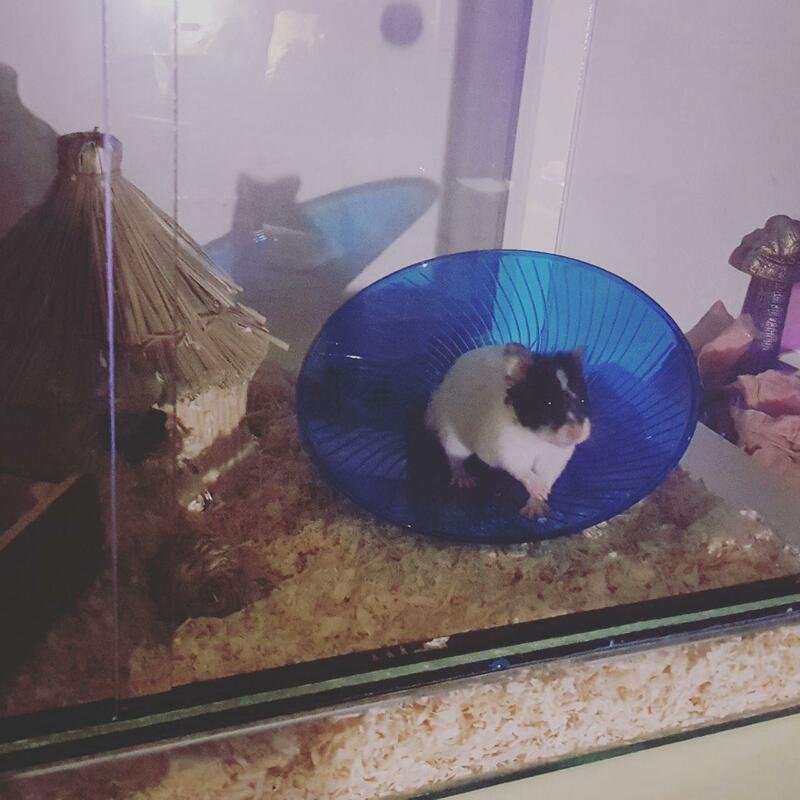 He does his own thing, of course, but in the rare moments that rodents stop doing what they're doing, he'll come to the corner closest to me, take a look and put his paw on the glass, or flatten out like some kind of bizarre fuzzy pebble and look across at me. I've tried a couple of times to go sit near him and talk to him a little bit. I've tried offering him treats, and he smells them but doesn't take them. He doesn't seem particularly scared of me, just wary. One thing I've been doing is making sure not to 'chase' him around. I'll offer the treat a couple times in the same place, but if he doesn't want to come up to my hands himself, I don't press the matter. I want him to feel like he has his own space and I'm a well-meaning visitor who he can choose to interact with, or not - but it's on his terms, and if he's not interested I won't take it personally. He's a busy guy. I can tell by all the running he does all the time - it makes me tired just watching him turn into a blur on that flying saucer disc thing I got him to replace his too-tiny wheel. He's kept in a tank with ventilation in the top, and sliding frontal doors. I thought the doors that open to the front were important. I want to approach him from an angle he can see me rather than dropping in from above like some freaky flesh-eagle. Nobody needs that. So when I visit him for a chat, I slide open the door part of the way, and put my hands there, and I talk to him. He comes up a couple of times to sniff, but otherwise he doesn't bat an eye. He'll go about his business on his wheel less than an inch from my hand, and I've played a game where I very slowly try to touch him when he runs - without turning his head at all as he runs like a maniac, he matches my movements in leaning his hindquarters away from my finger. It's subtle but undeniable and I find it very funny. I don't do it enough to trip him up when he's running though - I'm just trying to get his attention. I think he knows that, though, and he's just ignoring me in an extremely pointed way, which I also find funny. I hope he takes a treat from me soon. 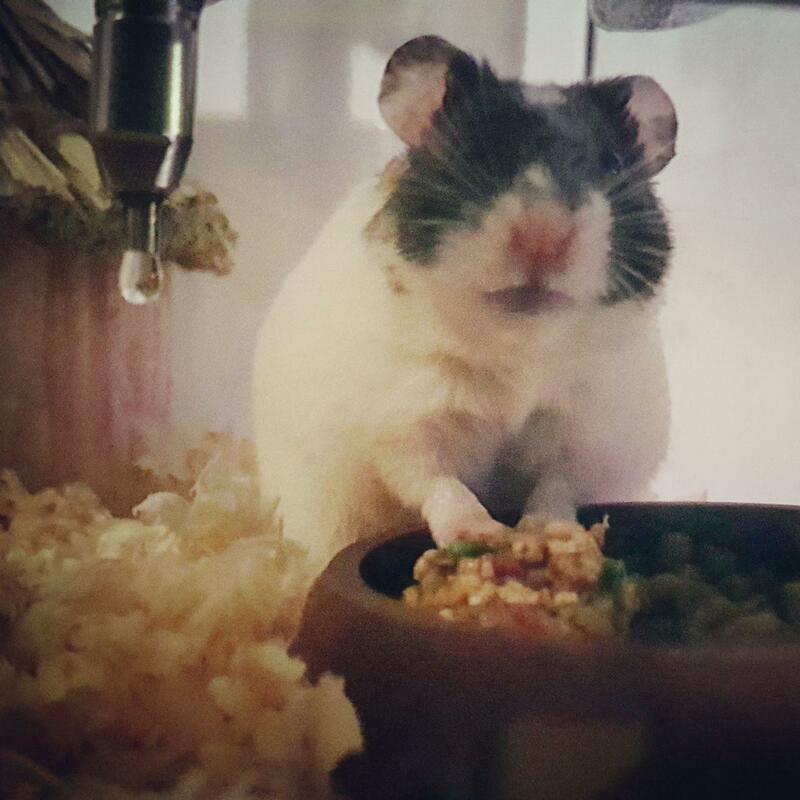 I've tried yoghurt drops, a tiny piece of sweet popcorn, regular food kibble, and a tiny bit of apple. I've no doubt he knows what they all are because he smells them, and then scoffs them when I eventually leave them in his dish or wherever. I'll try with baby carrot tomorrow. Maybe he just doesn't want to bite me and isn't sure where the food ends and I begin, since hamster vision isn't exactly hawk-like. He seems pretty active, and extremely non-aggressive. He's not tried to nip me or rush me, and he's had the opportunity for sure. I'm going to try prodding him a little more once he starts taking things from my hands. I don't bother him when he's sleeping, as much as I can help it, since I work from home, so maybe that helps his disposition, I don't know! I hope I'm doing alright. 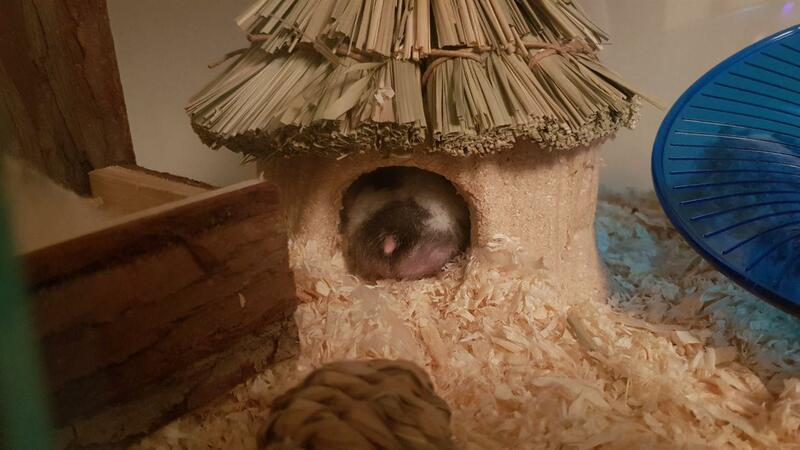 Here's Trooper in his hut. Sounds like the two of you are getting along fine, I'm sure he'll soon gain in confidence & be taking treats from you, maybe try something like a sunflower of pumpkin seed that he will find it hard to resist! Looking forward to seeing more of him. You did mention kapok which isn't considered safe, far better to just give some shredded up plain white toilet tissue for nesting. Is Kapok fluff not safe? I honestly did not know that - of course, it says it is on the label, but as experienced pet owners know, what a manufacturer says is safe often differs from reality. I'll have to look into that. He's still sleeping at the moment, so I'd rather not go bustling about in there to remove the stuff right now. I'll wait until he's up so he can see me do it and I'm not bothering him. I know I hate being woken up! I'll pick up some sunflower seeds. About to go to the shop for some carrots and stuff too. Maybe I'll have better luck with those! Great pics of Trooper, he's very cute and sounds like a great character! Troop took two treats from my hand yesterday! Seems he's learning. Trooper is adorable! It sounds to me like you are doing the training perfectly. Glad to hear he has taken treats from you. Look forward to hearing more about Trooper! Aww Trooper is lovely. I love his colouring. Name suits him too. Glad he's taken treats from you already. Looking forward to reading more about Trooper. 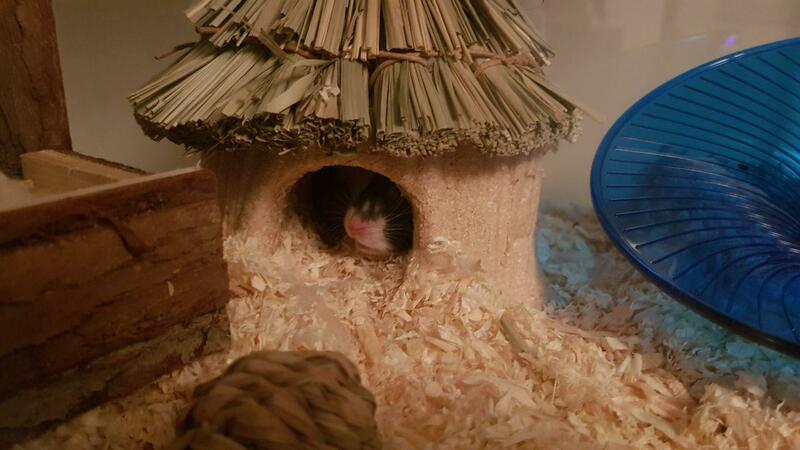 Aww Trooper is such an adorable hamster! So great to hear he has taken well already! Really exited to hear more about your adventures together!